It is no secret now that the major driving force behind the current floor or temporary recovery in the U.S. residential home market is the enormous money entering through the investment funds. These funds are entering cities and purchasing home after home after home for cash with the anticipation of renting them out. Before we go on I find it fascinating that many writers feel that this is just another "evil banker move," saying that "we will all become serfs to these new landlords." I feel the exact opposite. This is exactly how a healthy free market heals itself, something I have been talking about for years now. Unfortunately, this is only a portion of the story and if it were to end there it would have been a happy one. When looking at the complete residential housing picture you find that it is still quite unhealthy, creating a bottoming foundation made of sand. On the other side of the demand dynamic you have supply. Banks continue to hold properties off the market and this I certainly do not believe is part of a healthy free market housing recovery. Accounting changes in early 2009, discussed relentlessly here since their inception, have allowed banks to hold assets as mark to myth. After the robo-signing scandal in late 2010 the number of foreclosures declined precipitously and that supply never returned. The banks found that if they artificially hold supply of the market they could create a short squeeze and increase the value of the assets they are holding on their books. The red portion in the graph below shows the foreclosure filings in the state of Florida. 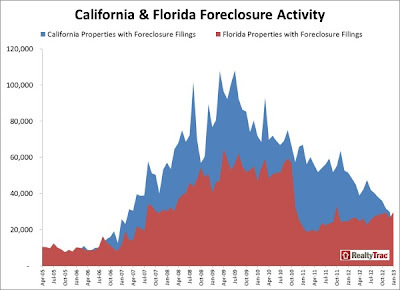 You can see the cliff drop in foreclosure filings when the robo-signing scandal hit in October 2010. Then when a settlement was reached last year something strange happened; the inventory (foreclosure filings) did not pick back up. You would believe that there would be a pent up level of homes building during the two year settlement period. By then the banks could see what was taking place. With that supply off the market it was already creating the artificial squeeze. Their hope is to trickle the supply back onto the market and keep the artificially low "supply" data in the brochures of every Realtor in the country. Why sell and take a loss if they can just hold homes at "full value" on their balance sheet? This is creating an artificial rise in the price of homes and there is nothing healthy or free market about it. Buyers entering the market today that have little understanding of what is occurring enter a bidding war with Wall Street (cash buyers) over the limited supply available and they think there is some sort of new mania in the market which is causing them to get caught up in a frantic buying mind set. This of course is tremendous news for anyone looking to offload a property. If banks were forced to put the real supply of homes on the market and mortgage interest rates were not artificially held down then the prices of homes would fall much further. This would allow investors and those capable of purchasing a home to do so at much lower levels. The monthly cost of living for everyone in the country would be significantly reduced allowing more money every month to be used for spending (boosting the economy) or saving/investing (boosting the economy). Real growth. Instead we continue to lurch forward in this zombie housing market and people with little understanding of what is actually taking place and getting caught up in the short term frenzy of markets will be once again be hurt badly, just as they were the last time.